After delays and false starts, it now appears that SouthPoint at SouthBank is ready for a sales launch. See this site and this site, for example. The development is on Grey Street, opposite the Galleria and next to the train line, on what has been called the Collins Place site. According to sales agents, the SouthPoint building has three sections, arranged vertically. The central section will be an Emporium Hotel, with residential apartment sections on either side (called the North and South cores). On the rooftop will be a 25m wet edge infinity pool, a day spa with massage rooms, hairdressing and manicure options, a roof top bar and gymnasium. From what I have been told, in the South core, the one bedroom apartments range from $425,000 with a Southern aspect and no car parking, to $560,000 for the top level facing the river with a car park. 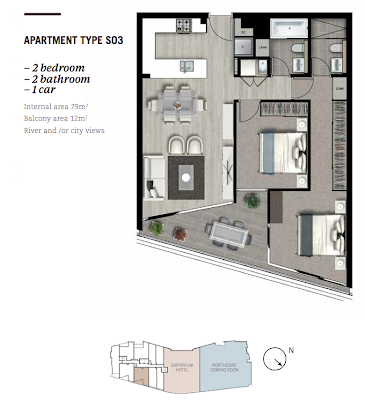 The one bedroom apartments are all less than 60 sqm in size. 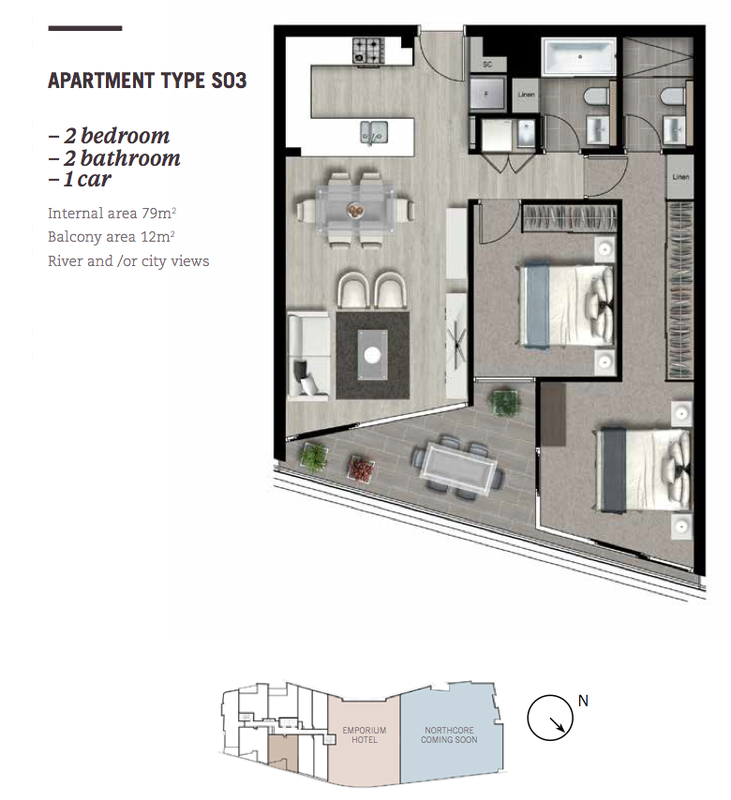 Two bedroom apartments in the South core start at $645,000 for a lower level rear apartment facing the railway line to around $840,000 for the top level river and city view apartment. These two bedroom apartments are all less than 80 sqm internal size, so are much smaller than similar apartments in Saville (Mantra) SouthBank. Compare also apartments in Quay West, where one bedroom one car apartments are about 73 sqm, and sell for about $450,000 with river views and furniture. In the North core, there are three bedroom apartments that range between $1.7million and $3.8 million. These appear to be large apartments. Apartments on the rear of the building face West, looking over the train line. There are surrounding buildings, so to get a good view, you will want to be on a higher floor. This development is by Anthony John Group, who is doing lower priced apartments in Cannon Hill. Their apartments in the Valley Emporium development were not, in my opinion, high quality apartments. It seems that SouthPoint will have three levels of finishes, so care must be taken to ensure that you understand what level of finish will apply to each apartment.